DISCOVER: Take a flashlight walk and look for spiders. Shine flashlights in bushes and tall grasses and look for eye shine. What’s the smallest spider you can find? EXPERIMENT: Hang a white sheet near a light to attract moths. How many different species can you find? How are moths different from butterflies? WONDER: Plant and enjoy a moon garden featuring plants with white flowers or silvery reflective foliage that virtually glow in the moonlight. Include varieties that flower at night or are particularly fragrant to enhance the sensory experience. OBSERVE: Start a moon journal. Draw what the moon looks like each night for a month. 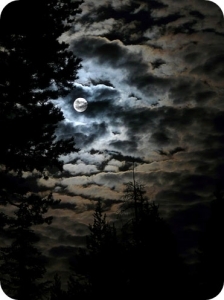 Discuss the phases of the moon and predict the date of the next full moon. GAZE: Study the night sky. Can you tell the difference between stars and planets? Satellites and falling stars? Download a free night sky app and identify constellations or invent your own constellations. 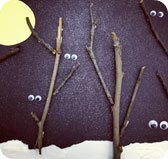 Create a night time nature collage. 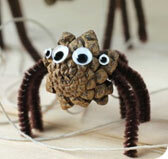 Make nature spiders. 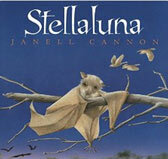 Read nocturnal animal books by moonlight. 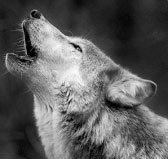 Have a howling contest.